Masala dosa is very popular Breakfast in south India. 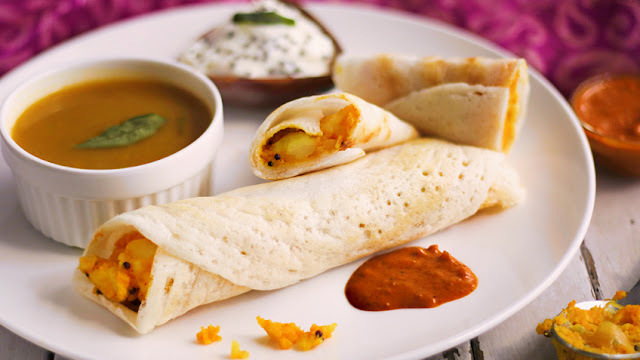 It is very thin and crispy south Indian crepe made from daal and rice batter,has earned India its place on the global cuisine maps.South Indian breakfast which is now popular all over the world - Masala dosa is a boiled rice pancake filled with boiled mashed potato bhaji. It is often served with coconut sauce and sambhar, but it only tastes very good with itself. It has become a more basic dose among the array of available varieties today! Step 1: Turn on the Flame,Take a pressure cooker and add water and potatoes. Boil the potatoes for around 4/5 whistle until potatoes turn soft.Add some salt while boiling the potatoes for giving a taste better.When Potatoes are done and drain the water,cut the potatoes into small Pieces. mustard seeds.when the begin to crackle,Add Asafoetida,urad daal,chana daal and cummin seeds.Wait until daals turns into light brown then add curry leaves and finely chopped green chilly. Step 3: Mix all things well at multiple times and add onion saute for 2 minutes.When onion turns into translucent then add Turmeric powder and Salt.Mix well cook for 1 Minute. Step 4: Add 1/3 cup of water.Let it cook over medium flame. Step 5: When water is almost boiling then add boiled chopped potatoes.Mix well all and lightly mash them with the help of spoon or masher.Cook all the mixture until mixture comes thick,for around for to 5 minutes maximum. (stir occasionally to prevent sticking). Step 6:Add finely chopped fresh coriander leaves and Lemon juice mix well. Stuffing for Masal dosa is ready. Step 7: Heat non-stick tawa over medium flame,when it comes hot sprinkle few drops of water n tawa for checking how much tawa is hoter. Add 1/2 teaspoon oil spread it evenly with the wet kitchen tawa.Pour a ladle full of batter and spread to as thin and evenly moving ladle spiral clockwise . Step 8: Spread the butter all around the edges and turns golden brown.cook for 2 minutes.place 3 teaspoon stuffing potatoes masala in the middle and press gently with flat spoon. Finally : Cook Dosa until bottom surface turns golden brown and crisp.The Masala dosa is ready.Serve Dosa with Bhaji or any choice of your gravy.